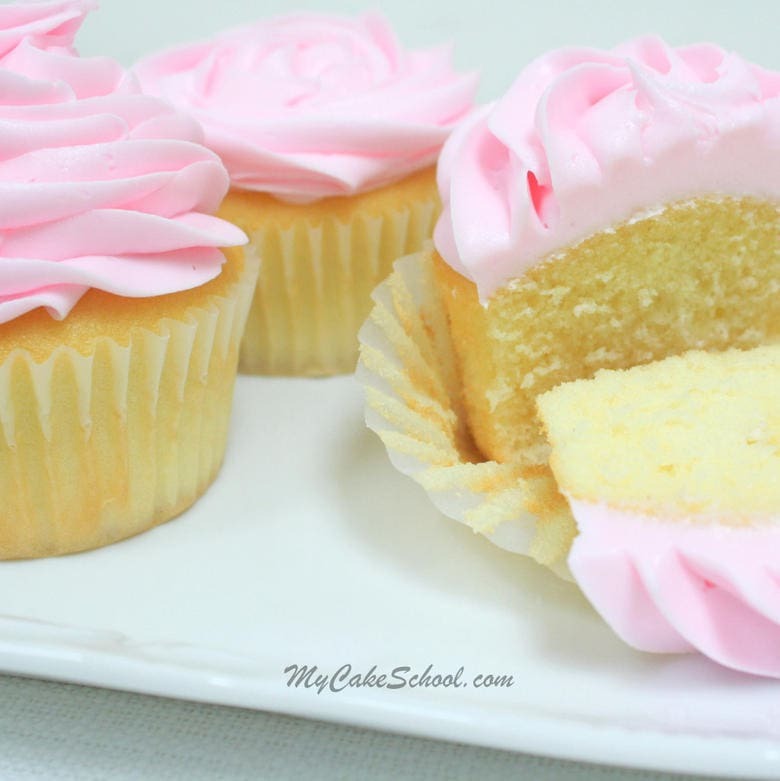 This moist and delicious White Cake (doctored box mix) recipe has a wonderful flavor and fluffy texture, making it PERFECT for both cakes and cupcakes. We have quite a few fabulous doctored cake mix recipes on our site, which have all of the convenience of using a standard cake mix recipe, but with a few extras that make ALL the difference in flavor and texture. I hope to one day have a scratch version and doctored cake mix version for each of our cake recipes. We’re off to a good start! This particular recipe has a “secret” ingredient. Nobody would ever guess, but a dollop of mayonnaise (2 tablespoons if we’re being exact) lends an unmistakable boost of moisture to this cake! I promise that you cannot taste it, but that added bit of fat really does make a difference! It’ll be our little secret. Mix all ingredients for 2 minutes on medium speed. Leftover batter can be refrigerated for up to one day. *Also works well for cupcakes! For cupcakes, bake at 350 degrees for 18 to 20 minutes or until a toothpick inserted into the center comes out clean or with just a few crumbs attached. I have another secret for a super moist cake that I want to share with you. I do this step whenever possible for both scratch cakes as well as doctored cake mix recipes. After removing your cakes from the oven, allow them to cool for ten minutes or so and then while the cakes are still warm, wrap them with a layer of plastic wrap, then aluminum foil, and place into the freezer. Whether you freeze your cakes for a few hours, or a few months, I guarantee that they will taste ultra moist. They key is wrapping them while warm, so that the steam/moisture becomes trapped and works it’s magic! *The “fluffy factor” of this White Cake recipe makes it less than ideal for covering with fondant. It could *possibly* work if the filled, unfrosted cake is fully settled for several hours and covered with a sturdy base coat of ganache frosting…but I wouldn’t recommend it. The softer the cake, the more likely it is to settle, and the added weight of the fondant makes it even more likely to bulge. This is my preferred doctored cake mix recipe for white cupcakes since they bake up nice and fluffy. However, for layer cakes, I also love this White Almond Sour Cream Cake recipe which is a bit denser! It is also a great choice if covering a cake with fondant. Also, make sure to check out our Chocolate version of this doctored cake mix recipe! This doctored chocolate cake is fluffy, moist, and deliciously chocolatey! 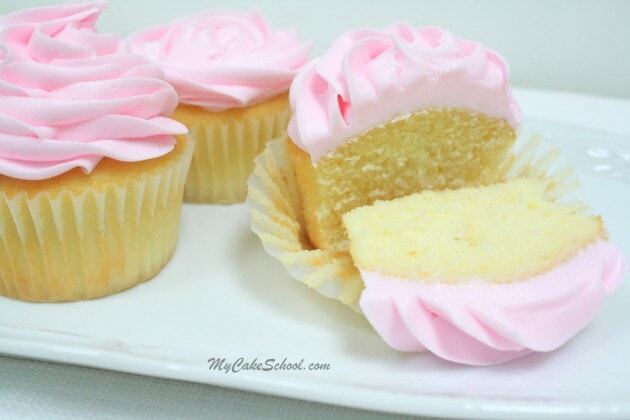 Again, a favorite of mine for doctored cake mix cupcakes! Chocolate Cake- A Doctored Cake Mix Recipe. Thank you for stopping by! Now that you have an amazing doctored White Cake recipe, you’ll need a fabulous frosting! We have SO many frosting recipes in our Frosting section, but for a great go-to Vanilla Frosting recipe, I highly recommend our Classic Vanilla Buttercream recipe! **Don’t miss our full collection of favorite tried and true recipes for cakes, frostings, and fillings in our Recipes Section! If you enjoy simple, free step by step cake & cupcake tutorials, we’d love for you to check out our Free Tutorials Section. Can you leave out the almond extract? Yes, it is fine to leave out the almond extract. I have an order for a very moist vanilla cake so i was planning to use this recipe as I suppose this is the moistest white cake . I have to cover the cake with fondant but it’ll be only one tier, a normal two layer cake. Do you think it’ll be okay. I have to bake it in a 10 inch pan so should I double the recipe. Il be using Betty Crocker. Hi Urooj, this is a very moist, soft cake and so it’s not ideal to cover with fondant as it may settle/bulge a bit under the added weight. My favorite cake mix cake for covering in fondant is our White Almond Sour Cream cake recipe (you can leave out the almond if you’d like). 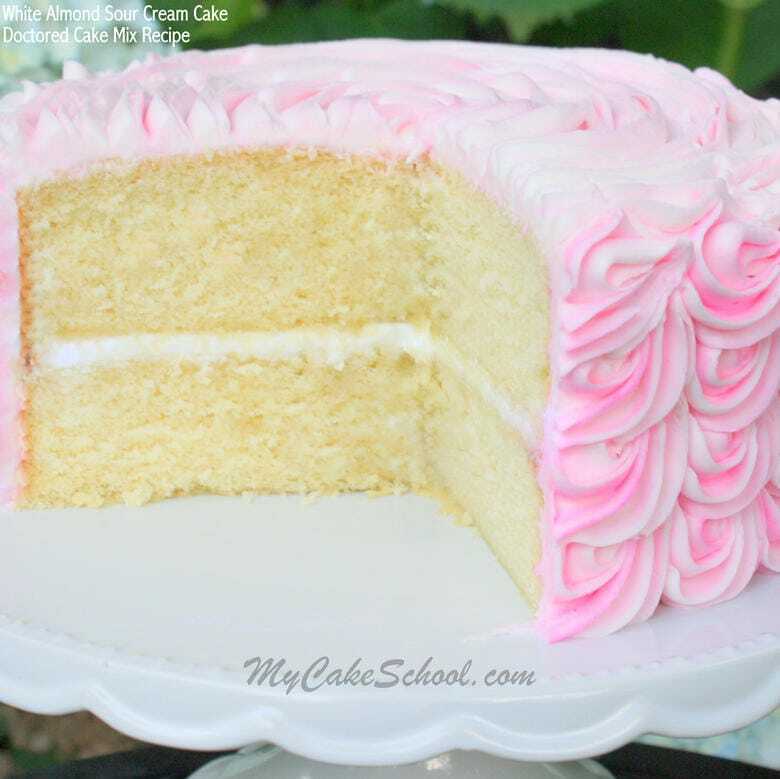 You can see Wilton’s chart for serving and batter info– but 6 cups is the approximate recommended amount per layer for a 10 inch, two layer cake. Straight box mixes (since they’ve downsized over the years) make approximately 4.5 cups of batter….but our doctored White Almond Sour Cream Cake recipe makes approximately 7 cups and so doubling the recipe would work well for a two layer 10 inch cake. NOo Eggs fr this recipe?/!!? Hi Rosa, Yes, there are eggs. Follow the directions on the back of the cake mix box then add other listed ingredients. Melissa list this just below the list of ingredients. Hope you like it. does this work the same with yellow cake mix? Hi Coco, Yes, you can use a yellow cake mix for this recipe. I plan on doing a small tiered cake, 9″ bottom and 7″ top layer; just buttercream and using bubble tea straws for supporting my top layer and board. Is this recipe too soft to use? Hi Tina, Yes, it will be fine to use this recipe for your tiered cake. So soft, fluffy, bouncy, jiggly. Moves a lot, not dense at all. I used two 6″ by 2″ deep cake pans and the cake was almost overflowing but just barely stayed in the pan.